A complete portable HD studio in a single unit. Single-person operation of sound and picture using faders, buttons and touch screen. 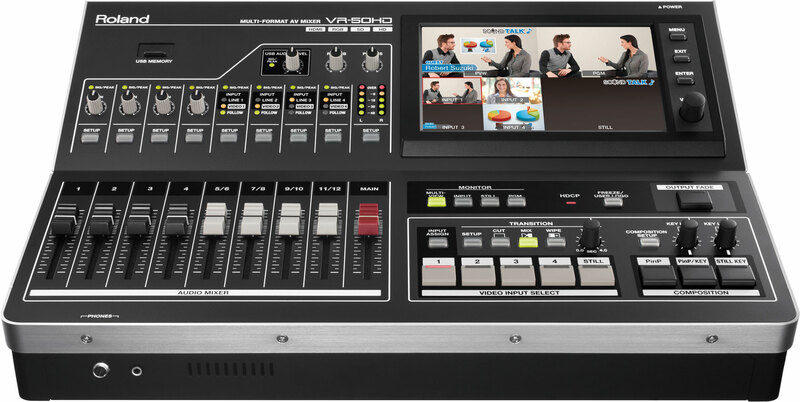 The Roland VR-50HD all-in-one AV mixer beautifully integrates an audio mixer, video switcher, multi-viewer touch screen and USB video/audio streaming into a stand-alone device. This single unit delivers functionality that until now required a number of peripheral devices to accomplish. This portable live HD production solution is ideal for schools, churches, council meetings, corporate events, sports, trainings, or any other live event. See the current VR-50HD Streaming Software Compatibility list for more information on streaming software compatibility. The USB 2.0/3.0 output enables web streaming with ease by simply connecting to a computer running a live streaming service. Recording is equally simple by using QuickTime or the dedicated Windows/Mac capture software, the Video Capture for VR. The video format is up to 1080/59.94p through USB3.0 and up to 720/29.97p through USB2.0. The resolution and frame rate of video format and audio level and delay can be changed thanks to the dedicated scaler and the dedicated volume and delay for the USB output.